Luxury handpainted a palatine Blue Irises, very soft and beautiful. 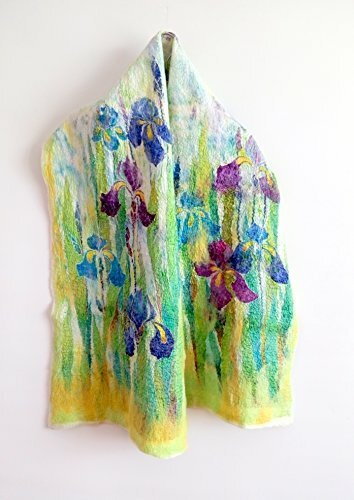 This scarf has two different sides-one hand painted flowers on natural silk-satin, in cold batik technique with special paints on silk and another- felt with the blend of shades of green merino wool and silk fibers.I used high-quality merino wool for felting. A silk scarf will give a perfect finishing touch to any outfit, whether it be dressy or casual. Would be a good gift for someone who appreciates individuality. Painted with special professional paints fixed steam that do not wash off. Measures : Length 180 cm/ 71", width 41 cm/16". All my stuff I send in special gift bags, made by me. I do my best to assure that all colors are accurate, but keep in mind that computer monitors can alter the colors. 1 . Dispatch time - All items,except custom orders, are shipped within 2 - 5 business days of the day of purchase. Some custom orders may take a little longer, depending on the case. 2. Shipping info .I ship worldwide from Ukraine. Terms & Delivery time: • Order processing time 1-3 days. • Delivery takes about 10-21 days (sometimes up to 1 month) depending on your location. The approximate time of delivery: - USA: 1,5 - 3 weeks - Canada: 2-3 weeks - Australia: 2-4 weeks - Europe: 8-20 days depending on location (Germany, Italy 2-3 weeks) - Japan 8-10 days Other: 2-3 weeks (sometimes up to 1 month) depending on location. I will send your order as registered airmail with tracking number. Please, don't worry if tracking pages don't always work correctly, it do happens due to human factor. But if something is still in doubt, ask me a question, we might be able to help you clarify the situation. All the items in my shop made with love and I am happy to share it with you! Care instructions: hand wash in cool water with a mild soap. Rinse well and squeeze out excess water(do not wring) dry flat, steam iron on a wool setting if needed Thank you very much interested in my store! If you have any questions about this product by Alla Taisheva, contact us by completing and submitting the form below. If you are looking for a specif part number, please include it with your message.